BOOKS REVIEWS BY JOHN ELBURG. Applying Logic in Chess is a highly interesting written trainings manual written by Erik, Kislik who is an International Master from San Mateo, California and so far I am aware of the only IM in the world who was a beginner as an adult (at age 18) and still became an IM. Going throw this book you will understand how Erik Kislik did mange it to become such a strong chess player. These 317 pages are highly instructive packed with topics which I have never seen before. For example you can learn a lot from your blitz games, although hardly anyone does,World elite blitz players have told Erik that they focus on concrete moves first in their fast games.This makes sense, because positions are very often concrete and seeing threats and specific ideas is very important with low time. For players who see things slowly,this is certainly something they can consider working on and applying. Gradually, one’s awareness of concrete relevant moves and tactical possibilities must improve with consistent work. Having a very tightly worked out opening repertoire is also very useful for blitz, even if you do not actively seek out an advantage in most of the games. In opening play,it is much better to focus on it’s understanding. Try to guess the moves and understand why they were played! The whole idea of memorizing openings is usually counterproductive at lower levels. People who memorized book analysis from 10 years ago have to forget the majority of what they learned.A lot of those lines have been overturned or refuted. Erik Kislik also explaines:I mostly remember openings due to their logic and strategic ideas. I used to have a problem with forgetting opening lines,but I always realized when I forgot the line that I never understood it in the first place. That is a major reason why fundamentally we need to understand our openings,there aims,and the intentions behind our moves. This all and more is well packed in 14 highly instructive sections! Minimum: Dual Core, 2 GB RAM, Windows 7 or 8.1, DirectX11, graphics card with 256 MB RAM, DVD-ROM drive, Windows Media Player 9 and internet access. Recommended: PC Intel i5 (Quadcore), 4 GB RAM, Windows 10, DirectX11, graphics card with 512 MB RAM or more, 100% DirectX10-compatible sound card, Windows Media Player 11, DVD-ROM drive and internet access. The two elements of artificial intelligence and human understanding have been the success of the Komodo chess engines. 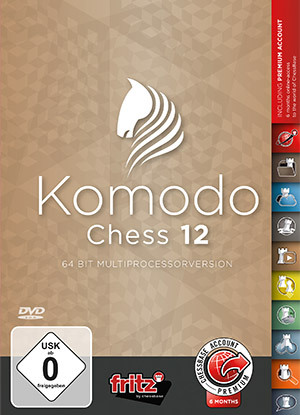 This new Komodo 12 comes with a brand new Fritz 16 program interface, with all the lovely utilities as the direct made access to the ChessBase play server. Dear reader please take care you don’t become as many of us a victim to bullet chess addiction! 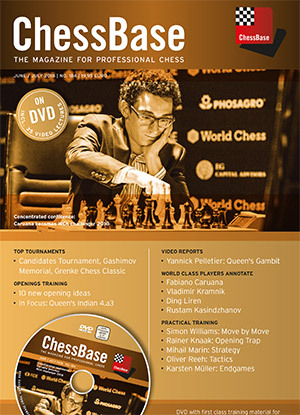 But there is more as a ChessBase Video- Portal, LiveDatabase,and much more. on the latest techniques of Alpha Zero and Leela! won both the 2017 World Computer. It plays now more aggressively and more human like and not to be compared of any other commercial chess engine of this time! strength of this program in an impressive way! I can only say import your Komodo engine into your ChessBase database program and you will be impressed about his strength and playing speed! moves in an revolutionary new way! The top grandmaster Yannick Pelletier belongs to one of the happy view who are able to win from regaining world champions, but this chess genius has more talents as he speaks fluent several language as French, English, German, Spanish and Russian, and belongs to one of the most appreciated live commentators that we have in the chess world. 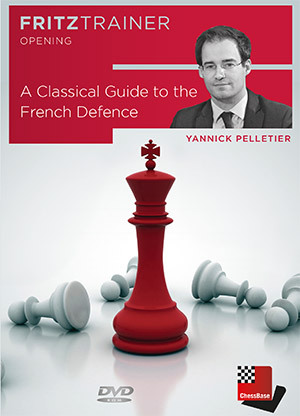 This well thought made DVD from Yannick Pelletier is based on understanding above memorizing, so the reader will learn to play and to understand the secrets of the French Defence in no time,and this all is pleasantry packed in two downloads plus a extra database of 170 entries where nearly all of these games are analysed by Pelletier him self! Running time is around 4hours and 27 minutes! Also included as a French setup download file! Conclusion: This DVD has a high instructive value! The European Championship files is good for over 1600 entries and the highly regarded tournament files holds a impressive 530 entries. Included is also a data collect file from over 2295 plus uncountable annotated games. All fans of wonder boy Magnus will enjoy his Fischer random match games against Nakamura! 1.d4 d5 2.c4 e6 3.Nf3 Nf6 4.Nc3 Be7 5.Bf4 0-0 6.e3 c5 7.dxc5 Bxc5. Other contributions are:Opening videos:Daniel King Breyer Variation a la Carlsen,Yannick Pelletier: Queens Gambit and Jonas lampert handles the Sicilian Four Knights. Endgames from Karsten Müller who belongs to one of the best endgame columns in the world,for example holds 24 annotated endgames, numerous training questions and four classic videos. In addition the endgame genius from Hamburg has recorded two endgame clips in the interactive format. Other contributions are: Williams:Move by Move,Rogozenco The Classic,Marin Strategy,Reeh:Tactics,Knaak: Recent opening traps and more. Conclusion:This is must have material!